Just before lunch on Thursday 15th October 1970, the West Gate Bridge suddenly groaned. An eerie pinging noise filled the air. A storm of rust flakes peeled off weathered steel. The girders started to turn blue. The bridge fell away beneath their feet. Minutes later, 35 workers were dead. On Tuesday 15th of October 2019, we will gather again to remember Australia's worst industrial accident, its victims and the brave workers who risked everything to recover the dead and hurt. 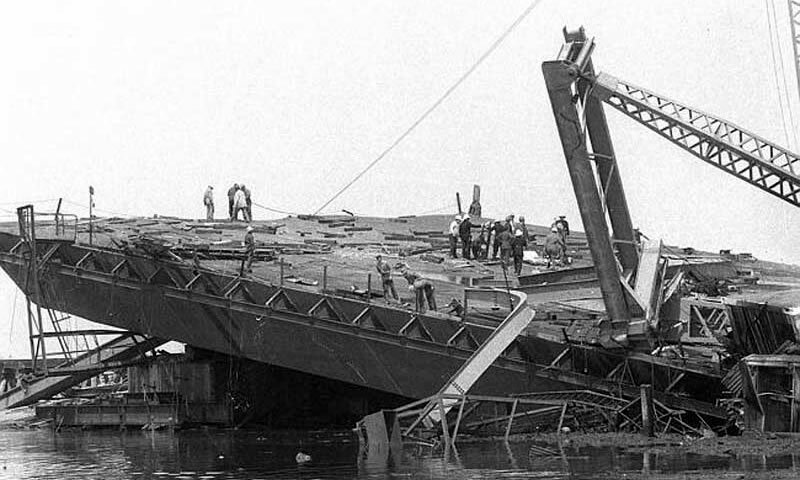 It will be the 49th anniversary of the collapse that claimed 35 lives, 18 workers survived, some of those workers returned to work on the rebuild of the bridge. The commemoration will begin at 11.30am at the West Gate Memorial site beneath the bridge in Douglas Parade Spotswood. The service is also held to honour all Australian workers who have lost their lives in the workplace. The West Gate Bridge is the large cable-stayed bridge that spans the Yarra River near the river's mouth as it enters Port Phillip bay. An important crossway between Melbourne's CBD and the western side of Melbourne, the bridge was the scene of a terrible disaster that took the lives of 35 workers when the bridge collapsed on October 15th 1970, the worst industrial disaster in Victoria's history. In 1970, two years into the construction of the West Gate Bridge, there had already been another disaster in Wales when the Milford Haven Bridge (now known as Cleddau Bridge) had collapsed earlier that year. Raising concerns about the safety of Melbourne's own newest bridge, a substantial program was begun in July to strengthen the bridge. Design flaws were in fact found within the bridge, and it seems that it was a combination of reasons that would cause the bridge to collapse later that year in October. Part of the problem has been attributed to the changing of hands between who was actually responsible for the construction of the bridge. There have also been allegations that at this time many construction flaws were not understood as they would be today, or worse still, that they were simply ignored due to construction being behind schedule. In 1965 the Victorian Government had established the Lower Yarra Crossing Authority (LYCA), a non-profit company to construct and operate the crossing, and two years later they appointed two firms, Maunsell and Partners, and the UK firm Freeman Fox Partners, as joint consultants for the detailed design up to the preparation of tender documents. Three years later in 1958, John Holland Construction was awarded contracts for the foundations work and concrete construction, while the contract for steelwork construction was awarded to World Services and Construction. By March of 1970 the erection of steelwork on the bridge was well behind schedule, and the LYCA made new contractual arrangements that would see World Services continue to fabricate the steel box girder spans that were needed, while John Holland took over their erection and joining. John Holland Construction, which had no previous experience in working with box girders, then transferred responsibility for many engineering decisions to the company, Freeman Fox, who had also been responsible for the collapsed bridge in Wales. Before the October collapse, two half girders on the western side of the bridge had been brought close together and it was found that there was a difference of about 4.5 inches in the camber, an important feature in construction which is the upward curvature of a girder that compensates for any displacement because of loading. While this wasn't the initial cause of the tragedy, the way in which it was remedied did prove part of the problem. The contractors who had the task of building the bridge, JHC, proposed that time would be saved if the difference between girders could be fixed by using kentledge (concrete blocks) to push down the northern side of the span. It must have also seemed convenient that there were ten cube-shaped blocks, each weighing around 8 tons, that were still on site from an earlier operation. Assuming that these blocks would give about the right order of load to remove the camber difference, they were positioned as a concentrated load near mid-span of the bridge. This remedy only caused another problem, however, when the placement of the kentledge caused a buckle in the upper flange, one of the ribs that support the bridge. Made of eight panels, the flange was held in place by bolts that were removed in order to straighten the buckle that had occurred. It was the removal of these bolts which caused the bridge to collapse. The span of the West Gate which fell, located between piers 10 and 11 of the bridge, was over 100 metres long and weighed at least 2,000 tonnes. The entire mass of the span fell the 50 metres to the ground and water below so heavily that the Yarra River mud with an explosion of gas, dust and mangled metal, causing buildings as far as hundreds of yards away to shake. Homes were spattered with flying mud and the noise of the collapse was heard for a considerable distance. At the time of the collapse, there were men who'd been working along the bridge and unfortunately there were others who were also down beneath the bridge where lightly constructed huts which had been placed directly beneath the span of the bridge that fell. When the bridge collapsed it caused the death of 35 men with many killed during the collapse and others who died later due to the injuries they had received. Many other workers were injured that day but were fortunate to have survived. The West Gate Bridge was eventually completed in November of 1978, but before it was opened a memorial plaque that honours the workers who died was unveiled on the 15th of October that year, marking the anniversary of the accident. Paid for by the workers who later completed the West Gate Bridge, that plaque is located near Douglas Parade in Spotswood and holds the names and occupations of the 35 workers who died in the collapse. Later in 2004 the West Gate Bridge Memorial Park was also opened on October 15th, commemorating these men who died while working on the West Gate Bridge. Highlighting the dangers that were often faced by all workers who have built our city and the great need to ensure their safety, the park also honours another tragedy that occurred on Good Friday in 1895 when six construction workers were killed in Spotswood during the collapse of the sewer tunnel beneath the Yarra. Every year, at 11.50 am on the 15th of October, family and friends of the workers who lost their lives, men who worked on the bridge's construction, and many of today's generation gather to remember those who were lost in the tragic accident. Amidst the tragedy of the West Gate Bridge's collapse, there was a great display of compassion and bravery, not just from the workers involved and civic officials, but also from the general public, whose hearts went out to those involved in the disaster. When news of the building's collapse began widely known the Government declared a disaster plan, assigning available firemen, ambulance officers and policemen to the incident. With a cordon established by the police around the disaster area, the cordon was broken not only for ambulances, nurse and doctors who were attending the site, but also for many of the public who had arrived to help including priests, Salvation army workers, and even Boy Scouts and passers-by who were willing to help all they could. Many workers were in fact reluctant to leave the site, determined to dig out those who were buried beneath the rubble and debris. One of these workers, John Laino, who wanted to help identify the dead and those who were unconscious, had been digging since the accident in spite of having fallen himself when the bridge gave way. Another worker, Bill Snowden, had managed to get out from under the falling bridge in time, but made his way back through the wreckage to dig out a fellow worker and stay with him until help arrived. When the rescue workers arrived he was covered in oil and mud and visibly weakened, yet he politely shrugged off the rescue workers' help for himself. John Dooty, who was 20 at the time of the disaster and known as a 'long haired larrikin' from Ascot Vale, refused to stop helping when the rescuers moved in. After spending his time helping to carry the injured and dead and also dig out the missing workers, it was only when he collapsed with exhaustion that he was revived and told to go home. And even then, he rested for no more than an hour before returning to help in the rescue efforts. Hearing of the news, a factory nearby, ACI, opened its canteen to provide food for those who were injured and in shock. The Port Emergency Service and the Salvation Army workers who'd arrived helped to clean off the injured and set up hot-drink areas. It was only after some time, once expert rescue workers had managed to gain some semblance of order amidst the chaos, that workers could be persuaded to return to concerned family and friends who had been waiting beyond the cordon. Rescue efforts at the site were carried on well into the night, with rescue workers using arc lamps to search for other bodies, and they were replaced by fresh crews of workers come dawn the next day. Cranes, trucks and bulldozers were brought in and men with oxy-acetyline guns began the difficult task of cutting through the twisted metal to look for the bodies that remained. One of the survivors who was below the West Gate Bridge when it collapses, Pat Preston, was lucky enough to escape harm when he heard the bridge give way and instinctively leapt from his seat and took shelter behind the rear wheel of one of the cranes as debris rained down about him. Aged just 19 during the disaster, Pat returned to construction of the bridge when it resumed in 1972, following the inquiry, but many of his views had now changed. His cavalier attitude, which was common among workers at the time, would be gone forever, and he would also develop a heartfelt passion that still resonates today. Having long since been active in several roles within ensuring safety standards in the industry, Pat has since gone on to become the Manager of the OHS & Environmental Unit of the Construction, Forestry, Mining and Energy Union, seeing the establishment of many of the OHS initiatives now entrenched in the Victorian commercial construction industry. Among the changes owed to Pat Preston's passion are the standardisation of grief counselling for construction workers and an industry-wide OHS induction agreement, inspired by the tragedy he witnessed as a young man. 11.50am - Observation of minute's silence and wreath laying at memorial plaque, under the bridge, Hyde St Spotswood.